When we were setting up our house and were looking for electrical appliances to buy, our contractor, who was working on the electrical work, told us not to buy BEE 5 star ceiling fans. The reason he gave us was that there was complaints that BEE 5 star rated ceiling fans do not give good air delivery. We looked around for some data and agreed to what he was saying and installed a regular ceiling fan. Three years later (last week) we decided to give them a try and got the ceiling fans replaced. To our pleasant surprise we found the whole experience much better than what we expected. We write this article based on our experience auditing homes and also on our measurement of the old ceiling fans we replaced and the new one we bought. While most people target only lights when they think about electricity savings, but fans contribute a lot more to the electricity bills and could be close to 30-40% of the electricity bills. Compared to lights that are switched on only in the evening (from 6 PM till midnight), ceiling fans are on for most part of the day and even during night. Also ceiling fans consume more electricity than a tubelight. Most people believe that BEE 5 star rated fans deliver less air and using the same may not give similar comfort as a regular fan. Even when we look at the data (link: http://bit.ly/QLiRvi), we find that BEE 5 Star rated fans have minimum air delivery of about 210-220 CMM whereas regular fans have the value of 250 CMM. But when we replaced the fans in our home, we did not find much difference in the air delivery of old and the new fan. The new BEE 5 star rated fans are as good as the old ceiling fans and in fact we are quite happy to have newer fans in our house (in-tangible benefit). And the best part is that the earlier fans were rated at 75 Watts, but the new fans are rated at 50 Watts (30% savings). In fact some BEE 5 star rated fans are also rated at about 45 Watts. How does it convert to numbers? 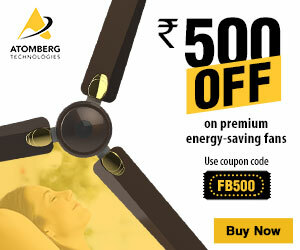 Above number show a clear saving of about Rs 600 per year (you can find per unit cost of electricity for you form our online calculator: Online Electricity Bill Calculator – For all states in India). If we look at MRP of various fans available in the market, the MRP of regular ceiling fans is about Rs 1400 (non decorative) and those of 5 star rated fans is about Rs 1900. Which clearly shows that the money can be recovered in about a year of usage. And as the ceiling fans run for long, there will be savings afterward. Unlike popular perception many private utilities (electricity distribution companies) are running programs that can help consumers reduce their electricity bills. They are also doing so as part of regulations from government. Being a customer of Tata Power in Mumbai, we got our old ceiling fans replaced for new ones at the cost of Rs 950 per piece (in exchange of old fans). Reliance Energy in Mumbai runs a similar program for ceiling fans. Even with that cost, if we look at above numbers, the return on investment will happen in about one and half years and we will save there after. So replacing old ceiling fans with new BEE 5 star rated fans also helps in reducing electricity bills. The above numbers are just for 1 ceiling fan. In case you have multiple, you can save more on your electricity bills if you replace your old ceiling fans. Do let us know your feedback in case you have used energy efficient ceiling fans.